So first I wanna dress my awful prediction that Gronk would end the game with 100 receiving yards and a touchdown. That was awful lol. Although how often does Rob Gronkowski, arguably the best tight end of all time get held to two receptions and fifteen yards? Its difficult to do but you gotta give credit where credit is due. Congrats Jacksonville Jaguars you played a very good defensive game yesterday. Gronk was held to one catch after the first play from scrimmage and wasn't really a factor after that point. Gronk talked about how well the Jags did after the game yesterday. "I was just trying to get open, that's all. No matter who it's [against]. And they just did a good job overall as a defense," Gronkowski said. "They're fast. They cover well. We've just got to be more prepared, and I've got to come out playing better." Everyone knows that Gronk is a major key to the Patriots offense. If Gronk Produces, then the Patriots Produce. Simple as that. Its a tough position to be in to get pounded by a team that they may have to face in January and hopefully not in Jacksonville. Gronk went on to talk more about the difficulties he had Sunday. "It's difficult versus a team like that. 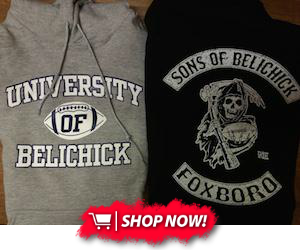 You've gotta be prepared and you've gotta be ready, and you've gotta find the openings," Gronkowski said. "And that's one thing I didn't do today." 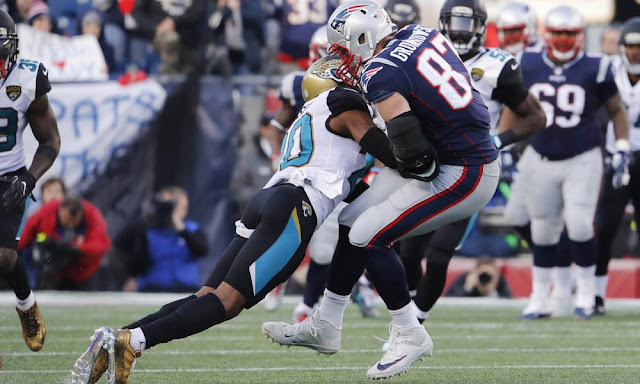 The unfortunate truth is that Gronk hasn't played well against that Jacksonville Defense. Last year in the AFC Championship game Gronk only tallied one catch for twenty-three yards. Hopefully this won't be the standard for him in games to come against a legitimate super bowl contender. Yesterdays game doesn't really scare me though. Its week 2. Edelman is still suspended and their defense eliminated Gronk, so who else really did the Patriots have? They had a bunch of new faces, who just couldn't get the job done. With the addition of Josh Gordon today, I think it'll provide a tremendous relief on guys like Gronk and Edelman, once he comes back in week 5. It also provides Brady with another reliable threat and another guy that teams have to prepare for. I can just picture them lining up together and it gives me chills. I mean that is if he can learn the playbook.